"Rangell plays the pieces with such verve, involvement and understanding that the CD deserves a (++++) rating simply as an exercise in excellent pianism..."
"Pianist-producer Andrew Rangell, who freely admits to having made Bach and Beethoven his primary musical priorities, turns his attention to the poetic power of the later style of Frederic Chopin with a series of nine selections, of which three of the composer’s ballades dominate. Throughout the recital, Rangell’s fluid capacities for inner voice and contrapuntal coloring add a degree of tension and harmonic depth to the experience, those same elements that rendered his survey of the Chopin mazurkas compelling. 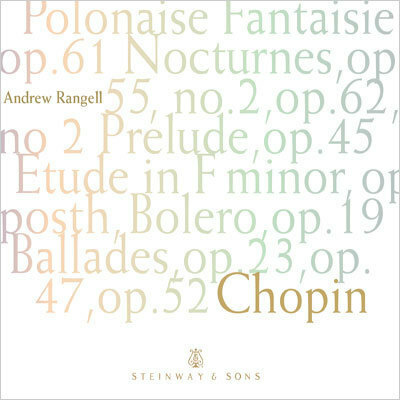 Rangell begins with one of Chopin’s most elusive works, the 1845 Polonaise-Fantasie, a piece Chopin he confessed did not “know how to name.” To sustain the extending line of this often meandering fantasy whose interior elements appear quite early and infiltrate its four major sections becomes the pianist’s ultimate challenge. Rangell, however, revels in the piece’s intricacies, its tonal sojourns into distant modalities, all the while singularly balancing poetic (in B Major) and (upbeat) nationalistic impulses. At moments, the forward motion virtually halts, and the suspension of time invites a haunted sense of space. The keyboard becomes a dark Aeolian harp, especially in the utterance of the opening arpeggios and their later return. The stretti of the coda assume a potent sonority after an almost grueling delay of their merging of former energies. Of the four ballades, Rangell’s realization of the A-flat Major, Op. 47 (1840) proves most individualistic: his extraordinarily slow tempo takes us through three octaves and resonates with a series of Romantic gestures in various scalar figures. The playful, rocking theme moves to an askew waltz, then assumes a more militant guise in syncopated motion. A move to C-sharp Minor suggests emotional depths that the colossal symmetry of the work might well conceal. The Neapolitan beauties, drama, and ferocious portent of the G Minor Ballade (1834) do not elude Rangell, though his personal fluency does not quite achieve the monumentality of Horowitz or Michelangeli. The secondary theme, a kind of modified barcarolle, becomes in Rangell’s reading, an exquisite high point. The epic Ballade No. 4 in F Minor contains the most counterpoint of any of Chopin’s essays in the form. Rangell seizes on the harmonic intricacy as the work’s chief virtue, aside from its dramatic intensity. The repeated G’s at the opening top line suddenly invade G-flat, and the labyrinth deepens. The next major episode involves Chopin’s fusion of sonata and variation forms, including a touching cadenza that glides into Bach polyphony. By the time the recapitulation enters, we recall how Josef Hofmann slammed his full wrist on the keyboard to exact the fff he wanted. Rangell, too, evokes a sea of keyboard sound to achieve the layered peroration that never ceases to stun its audience. The other delights may be more modest in scale, but remain nevertheless audacious gems: the so-called “Andalusian Souvenir,” the C Major Bolero, Op. 19 (1833), provides Rangell a cornucopia of color and rhythmic flexion, just as it well served Mieczyslaw Horszowski of the last generation. In spite of the Allegro vivace evocations of Iberian guitar sonority, a Polish national flavor manages to emerge as an afterthought. Of the three 1839 “Nouvelles Etudes” for the publisher Fetis, Rangel chooses the F Minor, whose serpentine melodic line may hold many a clue to the Berlioz experience. The undulating left hand in quadruple meter has much in common with the Fantasie-Impromptu. The 1841 Prelude in C-sharp Minor enjoys an improvisatory series of roulades in the manner of the Polonaise-Fantasy, but its aura of mystery remains unique. Rangell well competes with Michelangeli in revealing its magical triads and what the pianist himself calls its “Brahmsian textures.” As a performer of the two late nocturnes, find Rangell more academic in the Charles Rosen school, and I prefer to inhabit those realms provided by Rubinstein, Moravec, and Arrau. But for lyrical, studied polyphony in Chopin’s late style, Rangell consistently remains thoughtful and dynamically sensitive. Perhaps not to every Chopin lover’s taste, this traversal of the Polish master’s selected works bears its own sense of mysteries with appropriate veneration and considerable bravura." Period: Romantic Written: 1845-1846 Poland Date of Recording: 7/2013 Venue: Shalin Liu Center, Rockport, Mass. Length: 14 Minutes 27 Secs. Period: Romantic Written: 1843 Paris, France Date of Recording: 7/2013 Venue: Shalin Liu Center, Rockport, Mass. Length: 5 Minutes 40 Secs. Period: Romantic Written: 1833 Paris, France Date of Recording: 7/2013 Venue: Shalin Liu Center, Rockport, Mass. Length: 8 Minutes 0 Secs. Period: Romantic Written: 1839 Paris, France Date of Recording: 7/2013 Venue: Shalin Liu Center, Rockport, Mass. Length: 3 Minutes 23 Secs. Period: Romantic Written: 1831-1835 Date of Recording: 7/2013 Venue: Shalin Liu Center, Rockport, Mass. Length: 10 Minutes 27 Secs. Period: Romantic Written: 1841 Paris, France Date of Recording: 7/2013 Venue: Shalin Liu Center, Rockport, Mass. Length: 5 Minutes 40 Secs. Period: Romantic Written: 1840-1841 Paris, France Date of Recording: 7/2013 Venue: Shalin Liu Center, Rockport, Mass. Length: 8 Minutes 38 Secs. Period: Romantic Written: 1846 Paris, France Date of Recording: 7/2013 Venue: Shalin Liu Center, Rockport, Mass. Length: 6 Minutes 2 Secs. Period: Romantic Written: 1842 Paris, France Date of Recording: 7/2013 Venue: Shalin Liu Center, Rockport, Mass. Length: 12 Minutes 45 Secs.